Close preferences, and try to send a message to anyone. 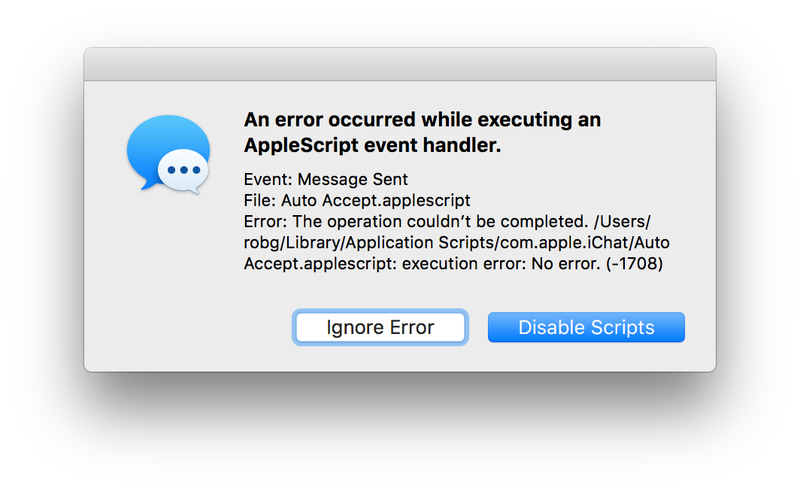 I especially like the execution error: No error message…it’s that rare non-error that tosses up an error dialog! In any event, I think it’s shameful that Apple ships the app with a feature—plainly obvious in prefs—that breaks when used. Yes, I know AppleScript is probably dying, but that doesn’t excuse shipping the app with a clearly-broken feature; if it doesn’t work, just remove it. Apparently this has been an issue since Yosemite’s release in October of 2014! I assume there’s probably a better fix—those commands I commented out have probably been renamed—but I didn’t bother spending any time looking for that fix, because I’m not getting paid to fix Apple’s problems. Did you create the Alert on Available script? I did – that’s what actually started me on this route. This used to be a standard feature, but it went away when Apple decided always-on Messages was the thing to have. I was trying to recreate it, though never got it to work. Error -1708 means a command couldn’t be handled. AppleScript is hopelessly vague about where an error originated (no such thing as stack traces), so you need to make sure it’s not being caused by any of the commands your script sends itself, but from your description I reckon it’s the initial received remote screen sharing invitation command that’s sent by Messages to your script that’s not being handled. I don’t use Messages myself, but from what I remember of Mail action scripts, the Mail devs designed it so that if your attached script defined a perform mail action with messages handler, Mail would call that, passing a list of messages and other information for your handler to work with. If the attached script doesn’t contain that handler, Mail just sends a basic run command that executes any top-level statements in your script, which is fine if you don’t care about the details. Sounds like the Messages devs have taken the same approach, only they’ve screwed up the implementation that causes the perform mail action with messages notification to miss your script’s perform mail action with messages handler. It’s probably a really stupid trivial bug too, such as the ObjC code that sends the received remote screen sharing invitation command to the script not using the exact four-char codes given in Messages’ dictionary. In which case it’s a 30-second fix, not counting the years of bureaucracy it takes to action it first! Thanks for this. I has successfully got my Messages speaking received iMessages but not received SMS messages. Is there any way to get it to speak SMS messages as well? It should work via SMS by default. Just enter someone’s phone number to send them a message. Sorry, I should have specified: I’m referring to the Speak Events.applescript. It wouldn’t work until I modified it as you said above. Now it speaks iMessages I receive in Messages (blue) but does not speak any SMS messages I receive (green). Ah, sorry … not sure. Perhaps SMS don’t trigger the same event notifications as do actual iMessages? I really don’t have a clue. Looking at the code, there’s nothing there to distinguish message types – the one line that does the speaking on a received message is “say eventDescription,” so maybe that field is blank (somehow) for SMS? No worries, just thought I’d check. Thanks anyway.